With human populations becoming more and more dense and ecological systems declining, urban nature parks present a potent opportunity to meet both the emotional and ecological needs of cities. Nature parks are needed to provide opportunities for people to connect to nature while also providing real environmental services. At the 2011 ASLA annual meeting, Laura Starr, ASLA, AIA, Starr Whitehouse, said that for urban parks, “every inch that’s not a ball field” needs to be handling stormwater, providing critical habitat, or otherwise performing ecologically. However, especially in the urban environment where landscapes must consider multiple types of use, wild parks cannot simply be hands-off preserves. They require mechanisms for maintenance, collaboration, and community outreach. Starr and Claire Beyer, LEED AP, Project Coordinator and Resource Specialist at Golden Gate National Parks Conservancy, discussed some of the challenges and successes they have experienced while working with urban wilds. Maintenance, maintenance, maintenance. As Laura Starr said, “If you don’t have a way to maintain something, you probably shouldn’t do it.” Starr, formerly Chief of Design for the Central Park Conservancy, which manages Central Park under contract from the City of New York, talked about her experiences with various Central Park projects. Central Park was designed by Frederick Law Olmsted and Calvert Vaux to embody rugged, picturesque, and pastoral qualities. Entering Central Park, the visitor is “put on this path… like a journey,” said Starr, and the environment “feels like being in the Adirondacks.” However, even when Central Park was first created it was necessary to employ patrols to protect this experience from misuse by the public. As the City has grown up and surrounded the Park, continued adaptations have been necessary to maintain the park while meeting the changing needs of the population. Within Central Park, the Harlem Meer is a water body that recently underwent a renovation. Originally designed to refer to a rugged and picturesque pond surrounded by a few meandering paths that allowed intimate access to quiet scenes, the Meer had later been modified by Robert Moses – the “master builder” of mid-20th century New York City – to deal with increased population pressures as the neighborhood grew up around it. Moses simplified the edge of the waterfront, doubled the number of paths circumnavigating the water, and fenced off turf areas to keep people on paths and protect the natural elements. Years later, the result was a disconnected, unwelcoming, and aesthetically unpleasant place that did not offer much to meet the City’s emotional or ecological needs. In renewing the Harlem Meer, the challenge was to balance the desire to restore Olmsted’s original vision with the needs of the residents, which included amenities such as a restaurant. The resulting design combined the natural qualities of Olmsted’s plan with contemporary solutions to ensure safety while also enabling greater access to nature experiences. The shoreline was restored to a more natural state, allowing for increased water filtration and habitat, and now children are able to borrow free fishing poles from a Discovery Center to fish in the Meer. The site was transformed into an activated, positive space, but still requires vigilance to ensure that the place is not misused, such as by swimming. Even though they may seem wild, parks need to be treated as public facilities: “The same way that people know not to touch paintings in museums, people need to be told how to behave in urban parks,” said Starr. Another example from within Central Park is the Great Lawn and the adjacent Turtle Pond, which were also recently restored by the Central Park Conservancy. The Great Lawn, a large oval of turf heavily used as a playing field and sunbathing area, was originally created by filling in and planting what had been the rectangular Croton Reservoir, leaving a small amorphous pond at the lower end – Turtle Pond. Over the years the turf suffered from its popularity. The restoration led by Starr and the Central Park Conservancy shifted the Great Lawn slightly north, updated the soil and underdrainage of the lawn to support continued heavy use, and enlarged and redefined Turtle Pond to enhance both the ecological function and the nature experience of visitors. Turtle Pond now features emergent vegetation, abundant wildlife, and a nature blind for visitors to experience “nature.” Nature is in the eye of the beholder, of course, for the entire setting is man-made. Starr pointed to features such as the created island within the pond, which is covered with emergent vegetation and looks quite wild and said, “Central Park is so established that people think whatever is in there is nature, not something that is evolving and needs planning and maintenance.” The Great Lawn employs a number of strategies to “protect nature from people,” including a red flag system that prevents damage to sensitive areas such as wet spots after a rain, and monitors who gently remind people of rules such as no dogs on the lawn. In addition to the large investments necessary to restore and maintain public nature parks, mechanisms for collaboration between public and private organizations enable the quality of ongoing care that is needed in these situations. Battery Bosque is a 3.75-acre section of Battery Park at the southern tip of Manhattan – “the most traveled park in New York City” because it is the launch point for ferries to tour the Statue of Liberty. Starr said that the previous Bosque was essentially “four acres of hardscape” that did not refer to nor do justice to the original beauty of the Hudson River, even though it is adjacent to the river. The park contrasted sharply with the lush imagery in paintings of the Hudson River School, and Starr noted that the natural abundance of Manhattan Island was responsible for the present density of the City. Therefore, in the renovation of the Bosque, which was a design collaboration with Piet Oudolf, Sarasota Associates, and Weisz + Yoes Studio, Starr said she decided to reverse the thinking about park design, first “painting it green,” then asking where paths were necessary. The result was a more natural and serene park setting, in which visitors can have a nature experience amid the bustle of the City. This redesign resulted in the need for more intense maintenance, which is performed through a collaboration between the Battery Conservancy and Parks and Recreation. “Nature parks cost a lot of money to maintain. They provide more benefits but need more care,” said Starr. Beyer talked about the symbiotic relationship between the different organizations in providing for the needs of these parks, especially between the Golden Gate Parks Conservancy and the National Park Service. Beyer said that the Conservancy has been instrumental in engaging communities surrounding the parks, raising money, and gathering and organizing volunteers. Education and stewardship have been the primary tools for engaging community members. The Park Service has supplied its vast resource of scientific knowledge, with specialists who have led the way in habitat restoration and resource conservation. One great example of successful community engagement and collaboration is Crissy Field, formerly an asphalt-covered airstrip, successfully restored to a park ten years ago. The new Crissy Field features a revitalized salt marsh, grassy fields, planted dunes and a shoreline promenade. In order to make this happen, the Conservancy raised more than $34.4 million in donations, and organized over 3,000 volunteers who helped plant 100,000 native plants. 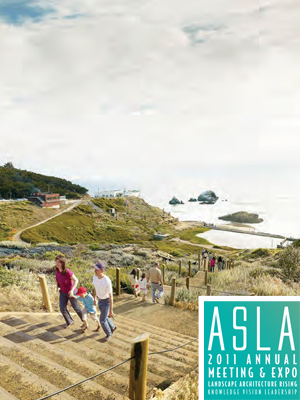 Beyer also showed that many small parks within the GGNRA have been subject to recent improvements, both to restore and improve habitat for species of concern and to ensure that they are fit to handle increasingly high volumes of visitors. These small parks, such as Land’s End, Muir Beach, Lobos Creek Dunes, and Mori Point, are surrounded by small communities on the outside of the larger Bay Area. However their accessibility to large populations means they need to be built to handle many people. Beyer said that the old model for these places, as wild parks with only small informal trails, is no longer suitable. However, major infrastructural improvements such as trail widening, stabilization, and bridge installation, such as at Muir Beach, can be difficult changes for the small communities to accept. Next Article Are There Any New Ideas on Cities?